Multiple configurations. The 5600 series offers a full-line of configurations to accommodate a broad range of applications. Both single- and dual-circuit models are available for low- and hightemperature ratings with either fixed temperature or combination fixed temperature/rate-of-rise (ROR) activation. The ROR element of the fixed/ROR models is restorable to accommodate field-testing. Installation flexibility. To satisfy a variety of installation needs, the 5600 series easily mounts to single-gang and octagonal back boxes. And these models accommodate four-square back boxes, when used with a square to round plaster ring. 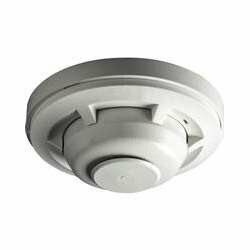 The reversible mounting bracket permits both flush- and surface-mount back box installations. Visual identification. The 5600 series provides clear markings on the exterior of the unit to ensure that the proper detector is being used. Alphanumeric characters identify the activation method, as well as the temperature rating, in Fahrenheit and Celsius degrees. Fixed temperature models are identified FX, while combination fixed/rate-of-rise units are marked FX/ROR. The 5600 series also provides a post-activation indicator in the form of a collector. When the detector is activated, the collector drops from the unit, making it easy to identify the unit in alarm. If you have any questions about this product by System Sensor, contact us by completing and submitting the form below. If you are looking for a specif part number, please include it with your message.